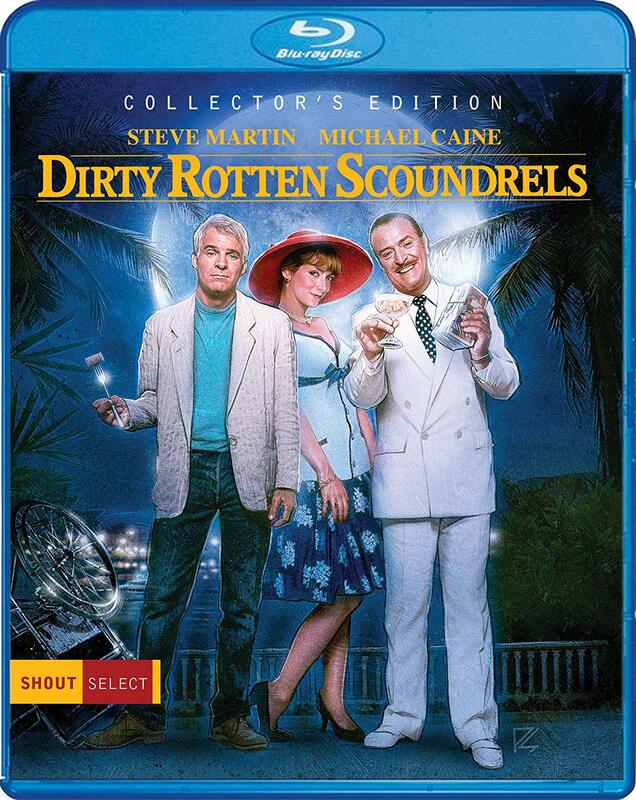 The latest title to get the special edition treatment from Shout Select is Frank Oz’s classic 1988 con man comedy Dirty Rotten Scoundrels, starring the dream team of Michael Caine and Steve Martin. The film follows Lawrence Jamieson (Caine), a suave English con man who is en route to the fictional town of Beaumont-sur-Mer on the French Riviera, when he runs into Freddy Benson (Martin), a shameless American grifter who is also travelling through Europe and enjoys ripping off women for free meals and petty cash. The two men clash, as they compete for who can best con the town’s wealthy women, before making a wager to settle who is the best hustler, once and for all. The first one to swindle fifty thousand dollars from a woman wins, and the loser has to leave town and never return. Their mark is Janet Colgate (Glenne Headly), a rich and naive American heiress who happens to be on vacation in Beaumont-sur-Mer. What struck me most about Dirty Rotten Scoundrels when watching it the other night, is that this is still an exceptionally fun movie. Caine and Martin have a lot of great interplay together, and because of the nature of the characters they are playing, they are able to assume multiple different personas throughout the film. Laurence often passes himself off as a foreign prince in need of money for his warring kingdom and, in probably the film’s flat-out funniest sequence, Freddy pretends to be his feral brother Ruprecht, an impersonation that works thanks to Martin’s genuine gifts for physical comedy. Written by Dale Launer and co-writers Stanley Shapiro and Paul Henning, who reworked the screenplay from their own 1964 Marlon Brando and David Niven vehicle Bedtime Story, the film whizzes along at a good pace, offering both sharp dialogue and moments of slapstick humour. The ending is also fiendishly clever, both for the way that it pulls the rug out from under our characters, and for how it completely upends their sexist viewpoints from earlier in the film. A little more than thirty years later, Dirty Rotten Scoundrels is still a riotously funny film, helped along by great comic performances from its central power trio of Caine, Martin and Headly, as well as a classy jazz score that gives it an air of sophistication to match the beautiful French locales. Altogether, this is an immensely enjoyable caper that offers an abundance of delightful scenes and still holds up quite well. The Blu-ray includes a new 2K scan of the film, a commentary track with Frank Oz, a new interview with writer and executive producer Dale Launer, a vintage featurette from the film’s production, the theatrical trailer for the film, as well as the original teaser trailer which is viewable with and without commentary by Oz and features footage that was shot exclusively for promotional purposes. Dirty Rotten Scoundrels: Collector’s Edition is a Shout! Factory release. It’s 110 minutes and rated PG.